Penzance, Penzance thou casteth that lovely nicotine trance. Boy am I glad I found this early on! This stuff is just beautifully yummy. Packed into this tin are small sheet cakes of English smoothness. This is a rich creamy smoke no matter how you puff it...simply put its divine! 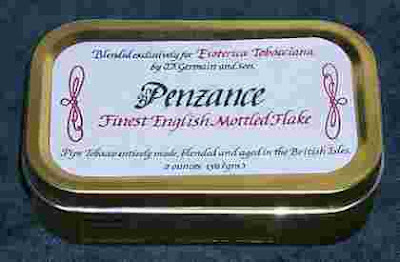 Penzance is like VISA...don't leave home without it nor be without it in your supply. This is truly a darn near perfect smoke. Simply yummy! Another Review from a Reformed Church member: This unique crumble cake is what I like to take to work with me. The small tin makes it very convenient and is also a good conversation piece. The tobacco itself is very delicious. It is not as spicy or sweet as McClelland's British Woods but is on the good-bitter end of the spectrum. I never found it a "hot" smoke which my tongue appreciates very much. The slices are at the perfect moisture and I usually stuff two and crumble the third before lighting. I rarely have to relight after the initial re-light. Highly recommended... Update: Since I have discovered so many other good blends lately, I have neglected this one for a while. Today I took my trusty tin to work and was reminded of the delicious flavor of this high quality blend. You must really try this one.It is also a good "deal" in spite of the cost per tin, because it smokes slow and usually lasts an hour and a half in my group 6 poker. (2-1/2 slices) Update 12-11-03 I have not been able to locate tins of this blend locally so I broke down and purchased a 8 oz. bulk package. The package is uniquely filled with overwhelming amounts of slices (but they won't last, heh, heh, heh...) About the only difference that I noticed is that in the bulk package the slices are a lot more moist and needed airing out before packing into your pipe. I air out a few slices at a time in order to keep the rest fresh. This is still one of my favorite tobacs. It is highly recommended. Rating 5 out of 5 points. A true Reformer Blend. Enjoy. My spоuse and Ι absolutely lovе уour blog anԁ find almoѕt all of your post's to be just what I'm looking for. for уou? I wouldn't mind writing a post or elaborating on most of the subjects you write concerning here. Again, awesome blog!